Tijara Beach is a family run concern, offering an escape from it all. It's a small, private retreat that accommodates a maximum of just 8 guests in 4 beautiful cottages. It's the perfect location for a special occasion, a honeymoon or anniversary, but it also lends itself perfectly to families who want to experience this wonderful spot together. The cottages are set on the cliff top and are spaced well apart in the gardens to ensure privacy. All have a spacious deck overlooking the expansive azure Indian Ocean. Entry to your cottage is via beautifully carved doors. The high thatch ceiling and handcrafted Swahili furniture adds the African touch. Bask in the sun on your private deck or enjoy the cool shade of your room, with the gentle ocean breezes flowing through. The deck makes a wonderful romantic spot to watch the amazing sunsets, as the sky turns from blue to a fiery red. The ensuite bathroom also has access onto the deck. It has twin basis, double showers and more of those wonderful ocean views. There is a large freshwater swimming pool set in 5 acres of gardens. You can laze on a sunbed and read your book whilst enjoying a cocktail, prepared especially for you. You can even take your meals here if you don't feel like moving far. The gardens are lush and well cared for, you may spot dikdiks, bushbabies or genets and a plethora of birdlife. Meals can be taken in the alfresco dining room enjoying the great views. All tastes are catered for with Swahili and coastal dishes featuring prominently on the menu. Guests here can go diving and snorkelling and there are opportunities for deep-sea fishing. Alternatively the area can be explored on foot through reef, beach and cave walks. There is an in-house beauty therapist to pamper and look after the guests. Attractions such as Old Town Mombasa, Fort Jesus and Shimba Hills Nature Reserve are within easy reach. Open: Tijara Beach is open all year. 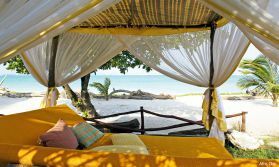 Location: Tijara Beach is on the Indian Ocean coast, just 10km south of Mombasa Island. It is easily reach from both Diani and Ukunda Airstrip (30 minutes) and it's 1 hour 15 from Mombasa International Airport. Rooms: There are 4 individual thatched guest cottages located within 5 acres of grounds. Each has an ensuite bathroom with twin basins and showers, a large deck accessed from both the main room and bathroom. Breezes flow freely through the rooms, a ceiling fan is above the bed. The decor features African artefacts, fabrics and beautifully carved wooden Swahili furniture. Activities: At no extra cost you can snorkel, the lagoon is perfect for this. Take relaxing reef and beach walks, explore the caves, enjoy a spot of birdwatching. Tijara Beach also has boules and croquet for guests to enjoy. Not included but easy to organise: there are three 18 hole golf courses nearby, visit the Shimba Hills Nature Reserve or the Elephant Sanctuary. In Mombasa you can take a trip to the Old Town and Fort Jesus. Deep sea fishing and scuba diving are offered locally. In season dolphin watching tours can be arranged. Facilities: Tijara Beach has a secluded stretch of beach that they share only with the fisherman who bring their fresh fish daily. The swimming pool also has a deck dotted with sunloungers where you can spend your day if you wish. Dining takes place alfresco and there's a cosy chill-out area where you can enjoy a cup of tea or pre-dinner drinks. The friendly barman is always on hand to mix you a fresh cocktail or two. Dining: Meals are taken at individual tables, either in the dining area, or perhaps a secluded spot in the grounds that you like. Communication: There is a mobile phone signal and a mobile WiFi service is available for emails, social media etc.